May is here and with it comes green trees and flowers. It is one of my most favorite times of the year. And around my home it also is the time to celebrate a rather important fun day. Yes, Star Wars Day is upon us. May 4th has been declared Star Wars Day ("May the fourth be with you!") If you think I'm joking, please just go Google it and you'll see that there are plenty of fellow Star Wars geeks like myself. So, to start us off this week, I present General Grievous pizza. My boys absolutely loved this. It was super easy to do as well. Roll out pizza dough into an oval shape. Make a couple small slices on the top of the oval and the bottom. 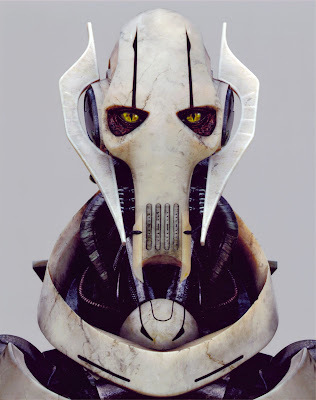 The bottom needs to be more squared off for General Grievous' mouth. Now, slightly open up the slices so that when they bake, they won't be touching. Place extra pizza sauce in two eye shapes where his eyes are going to be. Surround the pizza sauce eyes with black olives. Cover mozzarella cheese all over (except the eyes). Place your sliced olives for the remaining decor above his eyes and for his mouth slits. Bake in a 425 degree oven for about 15 minutes or until the crust is baked golden to your liking (less for soft, longer for crunchy). For even more fun, serve Han Solo trapped in Jello-nite. (get it? 'carbonite' 'jello-nite'. OK, I'm a geek) Just make some jello according to the package. Add a little black food coloring to get it more a darker color. Place in the refrigerator just long enough so it's not liquidy. 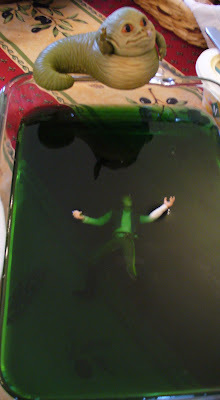 Place a clean Han Solo in the middle with his hands sticking up out of the Jello. Finish in the refrigerator until solid. So cute. I can't wait until my girls are older and can start helping more in the kitchen.